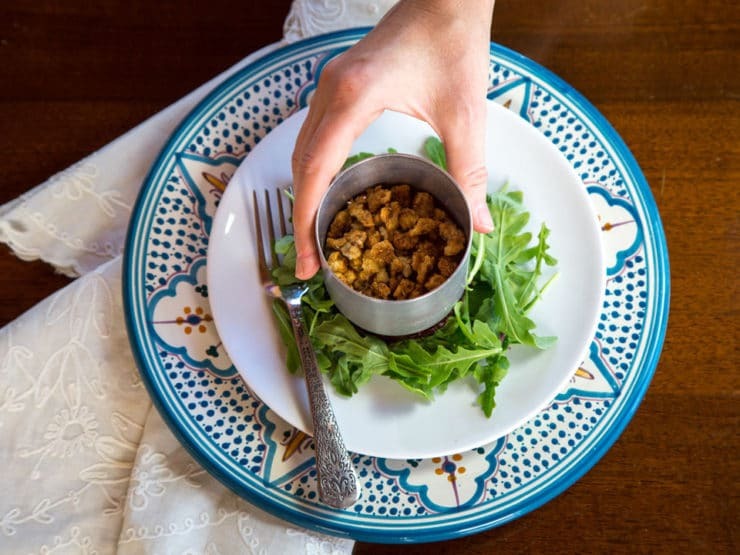 Arugula, Balsamic Vinegar and Spicy Candied Nuts. When I was in Seattle for a food blogging conference back in 2012 I had lunch with Cheryl Sternman Rule, author of the cookbook Ripe. Her friend, a Seattle local, had recommended a place called Steelhead Diner in the Pike Place Market. This was no ordinary diner! We had a terrific meal. 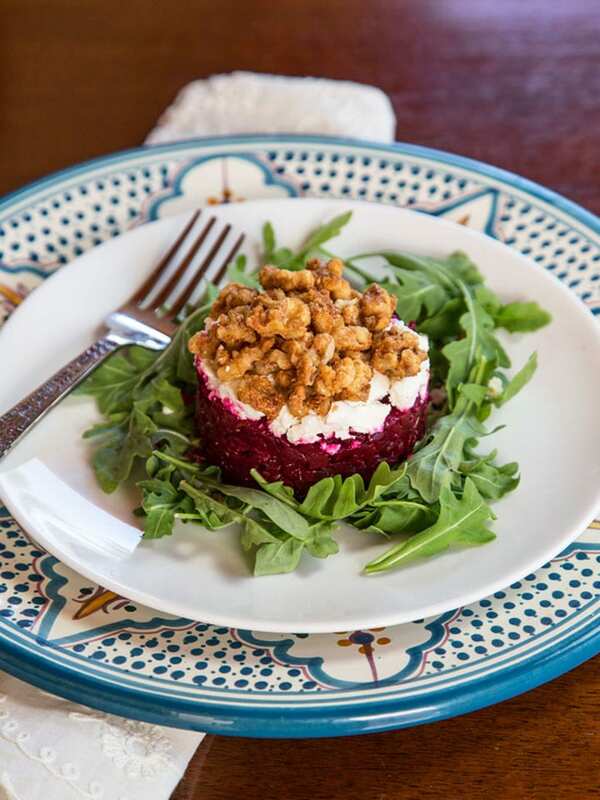 One of the highlights was a Beet Tartare salad– beets, chopped into small bits like beef tartare, served over arugula and topped with crumbled blue cheese. I loved the sweetness of the beets and the bold blue cheese– the combination was awesome. I made a mental note to make my own version of the dish at home. This recipe is the result. Roasting the beets makes them juicy and succulent. If you’ve only boiled beets in the past, you’re going to flip over the roasting method. It draws so much more flavor out of those beautiful, colorful beets. If you’ve never roasted beets before, click here for a tutorial. I dressed the beets in balsamic vinegar and a little olive oil for a rustic sweet-tart flavor. Knowing many of you aren’t fans of blue cheese (it’s certainly an acquired taste), I’ve used feta cheese here. You can use either goat or feta, both will work great. I prefer the salty tang of feta, it goes really well with the sweetness of the beets. At the end, I felt like a bit of crunch might be nice, so I quickly candied some chopped nuts on the stovetop with maple syrup and a small dash of cayenne pepper for a touch of heat. If you’d like to shape the salad into a circle, use a food or cake ring, or some sort of open-ended ring, to gently pack the salad into, then slide the ring off before serving. If you don’t have access to this kind of ring, I’ve heard of people using clean tuna cans for this purpose (I haven’t tried it myself). Use a can opener to cut off both the top and the bottom of the can, then use it to mold your salad– watch out, those open cans can be sharp! The important thing is that the interior of the ring be smooth, with no rough edges to catch on the salad, so it slips off easily. You can also purchase a cake ring at any specialty kitchen store. Or, you can mound the salad naturally onto the plate… who says we need to be so fancy?? It will still be beautiful and taste amazing! This salad has texture and so many flavors– soft, crunchy, sweet, salty, tangy, and just a tiny bit spicy. It’s a serious party in your mouth, and a fabulous starter to a meal. You can roast the beets ahead of time, dress them, and let them marinate in the fridge for up to 24 hours. The rest of the salad takes less than 10 minutes to prepare. Enjoy! 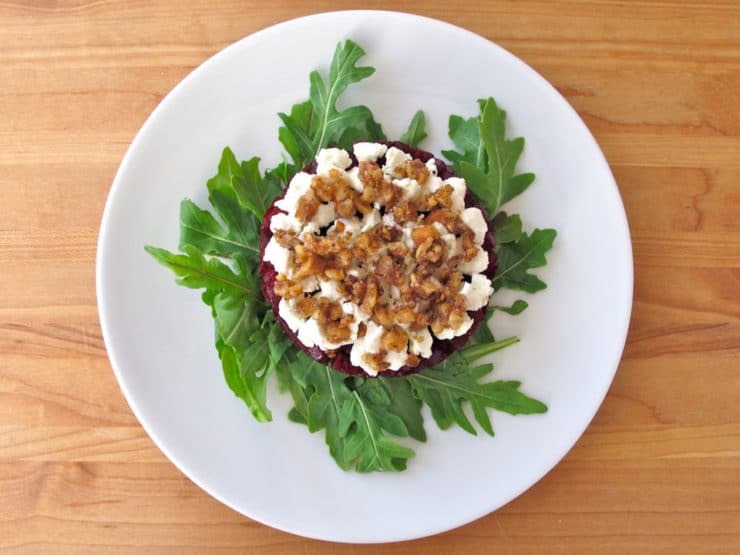 Learn to make Roasted Beet Tartare, a tasty beet salad with balsamic, olive oil, arugula, goat cheese or feta and maple candied walnuts. Learn how to roast beets by watching the video or click here for a tutorial. Peel the roasted beets and let them cool to room temperature. Dice them into very small cubes. 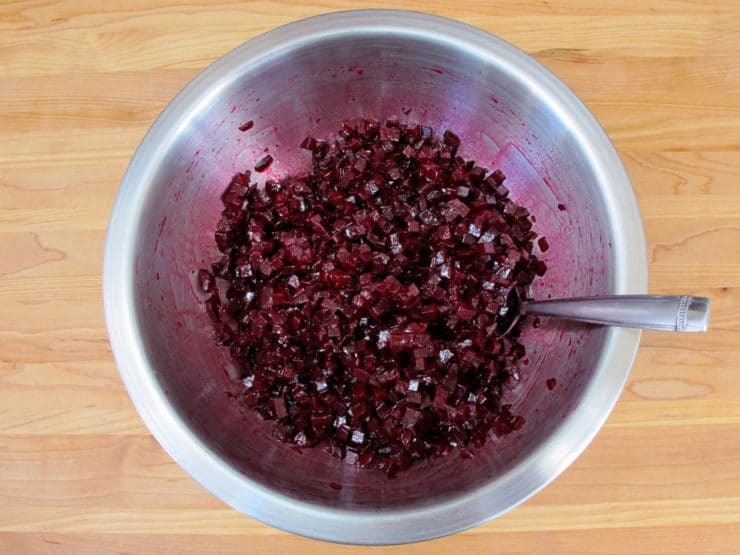 Drizzle the diced beets with balsamic and olive oil. Toss to coat. Season with salt and pepper to taste. At this point, you can refrigerate the salad till ready to serve, if you plan to make ahead. The salad is good both at room temperature and chilled. I prefer it chilled. 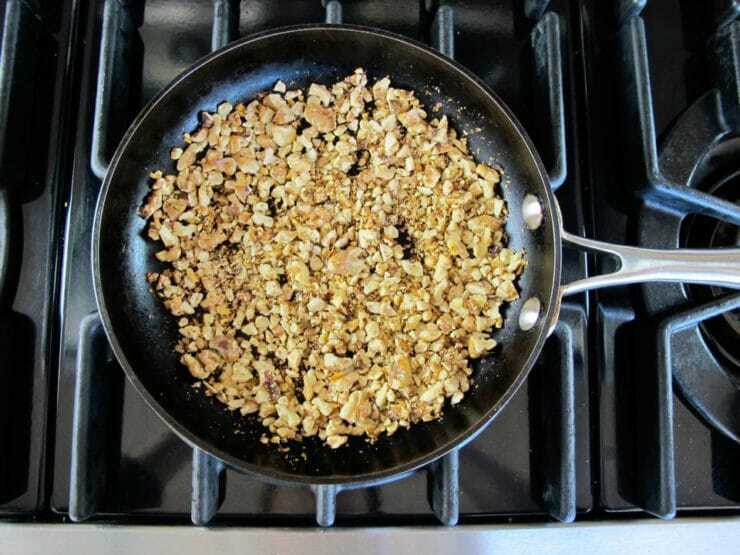 When you're ready to serve, place the chopped nuts into a skillet. Toast over medium heat for 4-5 minutes till toasted and fragrant. Watch closely to make sure the nuts and their skins don't burn. 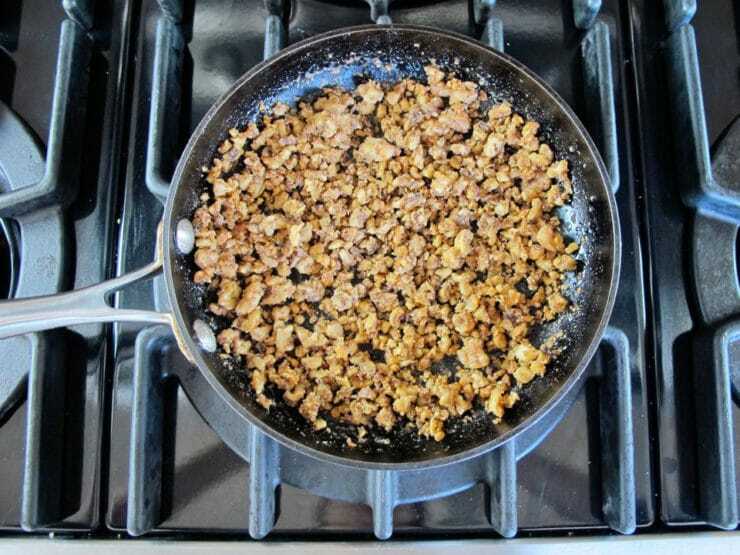 When nuts are toasted, add maple syrup and a dash of cayenne to the skillet (only a small dash of cayenne-- it's spicy stuff!). Stir well as the syrup heats up and begins to boil. Let the syrup continue to boil for 1-2 minutes until most of the liquid has evaporated. Remove skillet from heat. Let the nuts cool enough to touch comfortably. 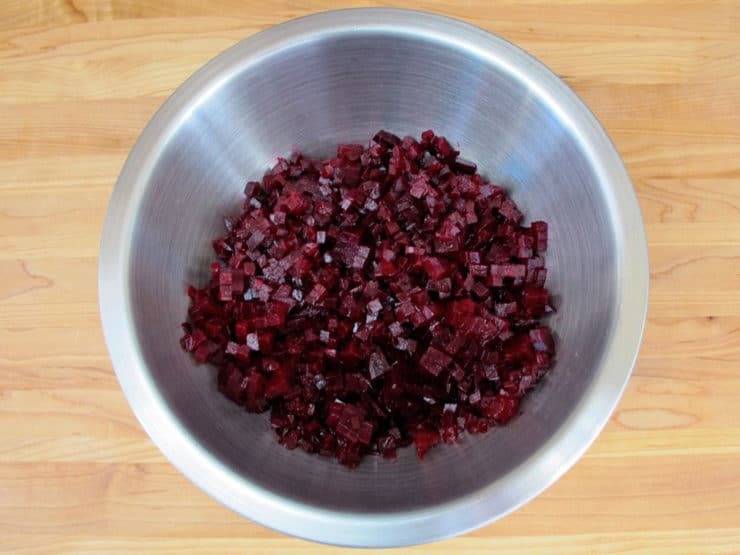 Break them apart into small candied bits. Assemble your salads. 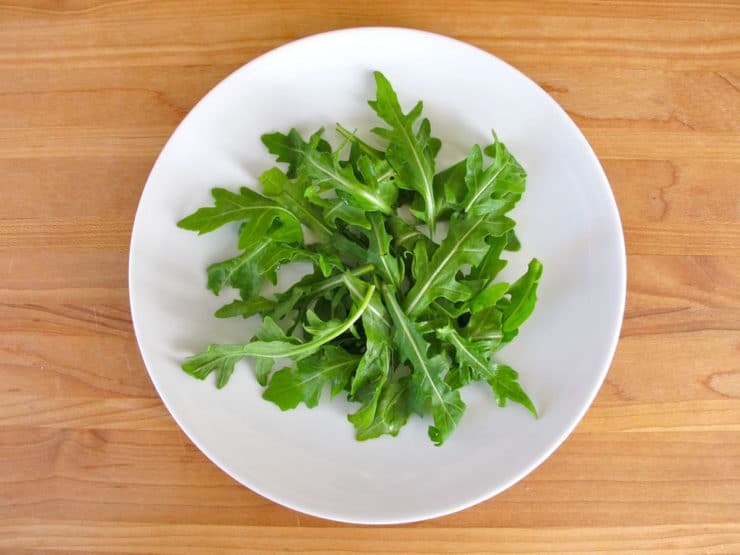 Place a handful of arugula on each plate. Mound a portion of beets onto the arugula-- about 1/2 cup per salad. I used a ring to help shape the salad into a neat circle. 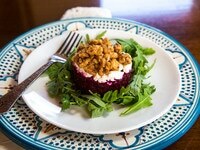 Sprinkle a portion of goat cheese or feta on top of each portion of beets-- about 2 tbsp per salad. Sprinkle a heaping tablespoon of candied nuts on top of each portion of cheese. Gently remove the ring (if using). This looks delicious! Could you recommend a substitute to make it vegan? 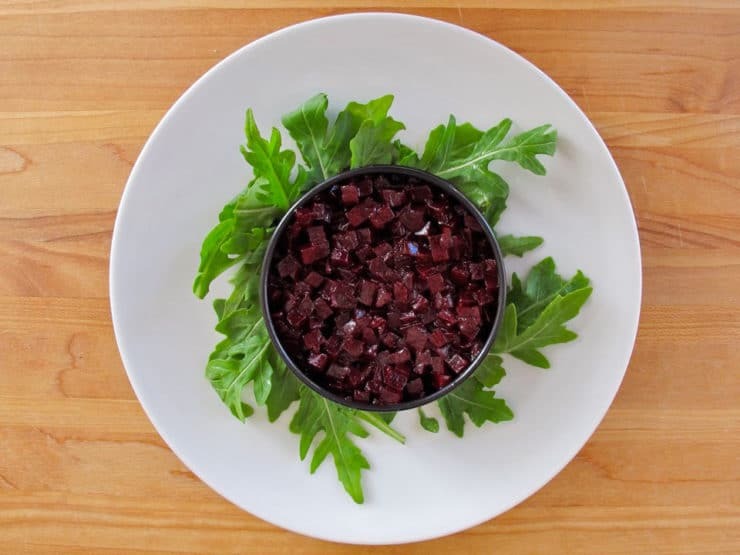 We get lots of beets in our CSA Farm bow and I’d love to try them out in this recipe. 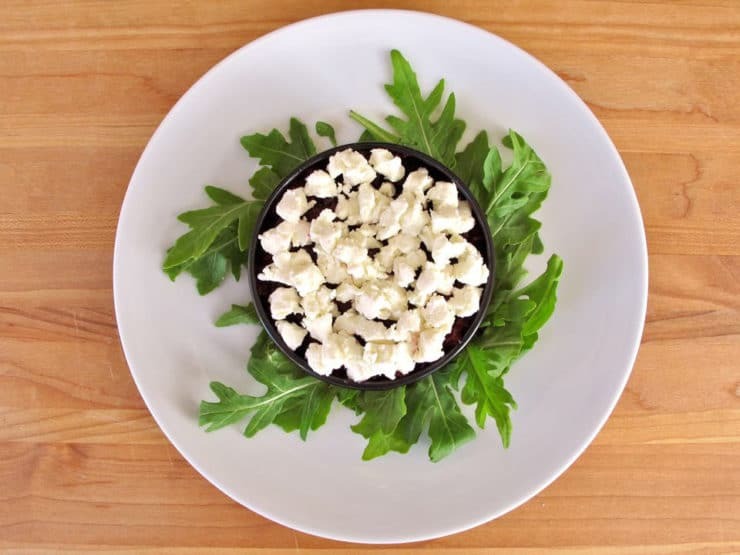 You can use a vegan cheese like vegan ricotta – you may need to salt it a bit depending on the vegan cheese’s flavor. Very yummy. Did the exact recipe with goat cheese. I thought it was fabulous…and so easy to make! Try it! 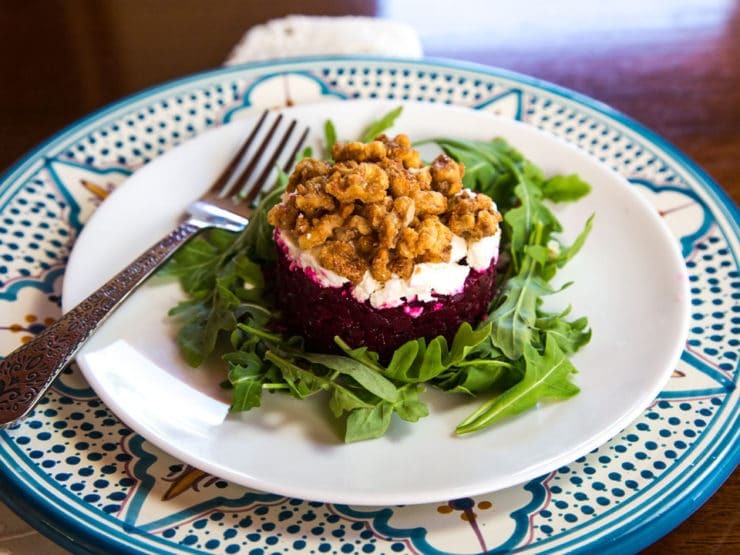 Tried this out during the Passover holiday this week for a dinner party with a few other of your amazing recipes, and this was a hit, only thing I changed up 2as that I used a blueberry goat cheese and added some extra fresh blueberries to the top of this dish…. it was awesome!!!! I will be trying it again today and will report back on my success! Thank you for sharing! It has piqued my interest in beetroot for sure! I LOVE that you have pictures of each step. The recipe is easier to follow that way. Thank you!! Went to a snazzy party and was served this amazing beet thing. (couldn’t get the recipe). Yours sounds just like it. thank you!!! As an appetizer, I combined the candied walnuts and mini diced beets together and served it in a endive “boat” with a small dollop of goat cheese on top. This was it! I made it. Well I just used what I had; cottage cheese and almonds. Was amazing! Very tasty. How far ahead can this be prepped for rosh hashanah dinner? wow this recipe looks so so good!!! I’m so excited to give this a try it seems pretty simple to put together and looks gorgeous on the plate. OMG! I have all of this in my fridge! The beet salad and goat cheese is the first course. The entree is another new recipe that was passed on to me by my aunt…beef spare ribs. I’m marinating them right now. Yums! What feta cheese or goat cheese did you use, it’s so many types and brands available. Happy New Year, this year to be outdone by the old in happiness, love, hope, faith, peace, and that the next year will be double. 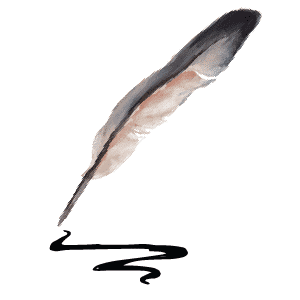 Have a happy and prosperous new year, with the ultimate redemption of Moshiyach Umein. Yum!! I want this right now! Looks so pretty and delicious! Must try! I initially read that as “roasted beef tartare…” and much confusion ensued. Really looks delicious and such a pretty presentation! I agree with David about you opening a restaurant. I try most of your recipes as I love to cook and everyone loves them, even my 7, 8 and 10 year old grandchildren. All the credit goes to you. Thanks so much. So sweet of you to say Robyn, thank you! Boy! I dream of being invted to dinner at your house! I tried this recipe a few weeks ago and loved it! I am making it again tonight for my sister in-laws surprise party! Thanks for sharing!! Cheers. Hi Lindsey– I’m not sure about candied pine nuts, it’s an interesting idea. If your allergies are nut-specific, would almonds work for you? I think chopped candied almonds would be nice here. I made this tonight pretty much exactly as written and it was sensational! Used biscuit cutter to mold, which worked perfectly. Thank you! Glad you enjoyed it Jess! I have a hamburger patty press that works very well as a mold to make this attractive tartare. Love the beautiful shape and colors! The colors are so pretty, and I just love roasted beets.